Work Wear neck tag with size, washing instructions, fiber content and last but not least...MADE IN U.S.A. 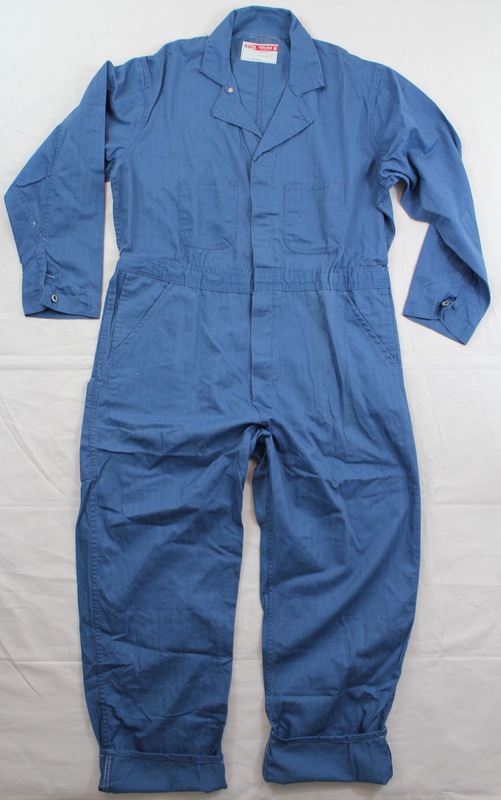 The WORK WEAR CORP. was incorporated as the Cleveland Overall Co. in 1915 to manufacture industrial work clothes. In 1919 they bought the Natl. Railway Overall Co., which made bib overalls and other work garments. To increase profits and expand the customer base, they successfully sold local companies on the concept of providing rental uniforms to their employees that would always be clean, in good repair, and have an identifiable company name & logo. In 1941 the firm established Buckeye Garment Rental in Cleveland as a research center for further development in uniform design and manufacture. During World War II it produced garments for the military and for wartime production workers. To retain its leadership, Cleveland Overall expanded its line to include coveralls, pants, shirts, shop coats, and protective clothing. Cleveland Overall became the publicly held Work Wear, Inc., and stock sales permitted it to acquire industrial laundries in the 1960s. Work Wear was charged with controlling the manufacture of industrial garments under the Clayton Antitrust Act in 1968. In a complex spinoff 9 years later, the company incorporated ARA Services to operate its U.S. rental operations and reorganized itself as Work Wear Corp., Inc., in 1977. Although the company retained its headquarters in Cleveland, it did not make clothes there after 1984.